We all have to respond to nature’s call. But at times, the call comes too sudden, and there’s no amenity to fulfil the need of the hour. The best portable toilets, your ultimate outdoor companion, might be the solution for you. 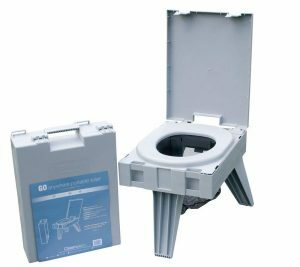 With a little bit of creative research, you can find a unit that combines the best functions of a standard toilet in one portable package. Luck for you, all the homework is done on your behalf. In this article, we look at the best move able toilets available in the current market. Plus, there’s a buyer’s guide that offers tips for making an informed choice. Without further ado, let’s get down to the specifics. It’s time to dig deeper and unfold the best picks on our list. Keep in mind that any of these units will serve your needs, whether you’re looking for the best portable toilet for camping or RV. Leopard offers a good compromise between beauty and innovation. Here’s one of its newly designed models, a unit that provides multiple options when it comes to fluid control. Latest T-port three directional flush gives a unique design advantage. You get a superior seal against fluid travel, which means no leakages. The valves provide full bowl coverage for a clean, complete rinse. A 3-gallon freshwater tank provides up to 50 flushes. The waste tank holds up to 5.3 gallons, which goes a long way before emptying. It has a gate valve that provides a tight seal to lock in fluids and odors. 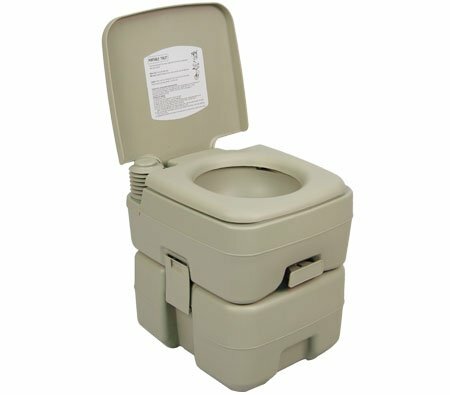 Leopard potty is a compact and lightweight polyethylene unit, but with a sturdy base. At 11.5 pounds, it’s easy to empty and transport. There’s a storage bag to keep it out of view when not in use. Though a bit too small for some people, it boasts a great invention. What’s more, it’s as versatile as it comes. Leopard is a durable, easy-maintenance unit that appeals even to indoor users. Palm Springs toilet provides the convenience you need, right out of the box. For once, you’ll be glad to get a unit that arrives fully assembled. A sturdy, full-sized seat makes it comfortable for people of all age groups. High-density polyethylene with scratch-resistant matte finish provides a durable construction. 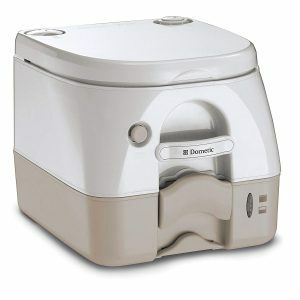 The unit is lightweight (9.75 pounds) and compact for hassle-free mobile use. It achieves that without sacrificing holding capacity. A combination of 3-gallon freshwater tank and a 5-gallon waste tank lasts a long while. The tanks have a durable and leak-proof one-piece construction. A double-sealed valve traps in odors to keep the surrounding fresh. The residential flush system makes it simple to use. Just one press of a button and you get a complete rinse. At 16.5 x 13.5 x 12 inches, it’s a great size for those that can’t make it to the bathroom. 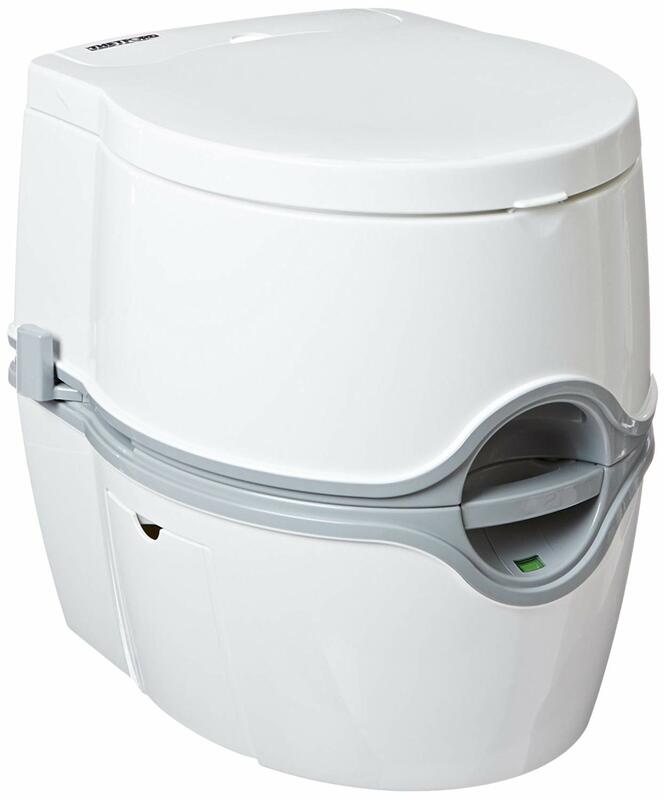 Palm Springs is a compact toilet that stores, transports, and functions easily. For some, the plunger might need a hard push to get the pressure. But overall, it’s a portable crapper that does its job well. Want a modernized version of a moveable toilet? Thetford 92360 has the right specs you’d want in a modern portable toilet. Sleek, classy and comfortable, it brings home-like luxury to the outdoors. 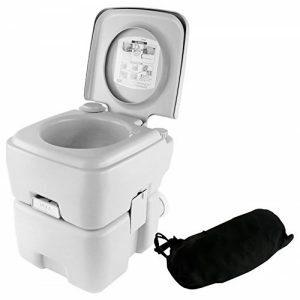 This portable crapper supplements its modern look with electronic controls. It has a unique, battery-powered flush control to save you the heavy work. Aside from this, you get hidden controls that monitor levels in the waste and freshwater tanks. A side lever functions as a manual backup for the flush system. The tanks are separated, so you can refill the freshwater reservoir and quickly empty the waste tank. A pivoting pour-out spout provides controlled splash-free waste disposal. The fresh water tank and waste tank hold 4 gallons and 5.5 gallons respectively. You get an average of 56 flushes, which can take you a long way. There’s an integrated toilet paper holder for easy access. The seat is a comfortable 20 inches high, the perfect size for average and tall users. A carry-handle makes transportation easy. Thetford 92360 is among the most innovative potties out there. It’s a bit pricey compared to other models, but the functions you get are above average. For starters, this is the 41541 model. There is a ton of reasons to like this portable toilet. It measures 16 inches high, so you don’t have to squat too low. In fact, it’s just the right size for people of all ages. 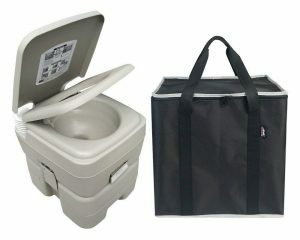 11.5 pounds for such a toilet size makes it super compact and lightweight to transport. Best part, it fits comfortably inside a car’s trunk. Camco 41541 has a flawless polyethylene construction, which offers comfort and durability in one portable package. The fresh water capacity is a bit low at 2.5 gallons. But on the bright side, only a bare minimum is enough to flush the waste. 5.3 gallons for the waste collection tank is pretty impressive. Together with the fresh water tank, it makes an ideal capacity for a small family. The toilet can handle up to 330 pounds, so it’s not going to give way. What goes in stays in, so there’s no odor. Once full it’s pretty easy to empty, thanks to a slide valve that takes care of all the burden. For all the practical features it offers, it’s well worth all the recommendation! To be honest, this unit looks more like a bucket than an actual toilet. But under the hood lies a perfect toilet for camping and boating trips. Good news is that you get it for a lot cheaper. At 5 pounds, it’s remarkably lightweight and portable. The lid opens up to reveal a contoured seat that provides hugging comfort. A snap-on cover prevents odors and leaks. There’s a toilet paper holder for added convenience. It’s 14 inches tall, a size that beats going into the bush and squatting all the way down. The inner bucket is removable for easy waste disposal. Hassock portable toilet uses toilet waste bags, which convert liquid waste into solids for a mess-free experience. Eco-fresh packet comes with the package. It does the work of a digester and deodorizer to break down waste and control odors. 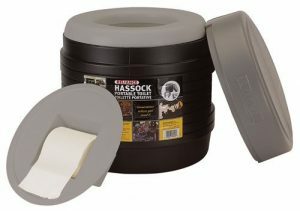 Hassock is an entirely portable, self-contained toilet, which offers the comfort of sitting on your home toilet. It makes an excellent option for the budget hunter. 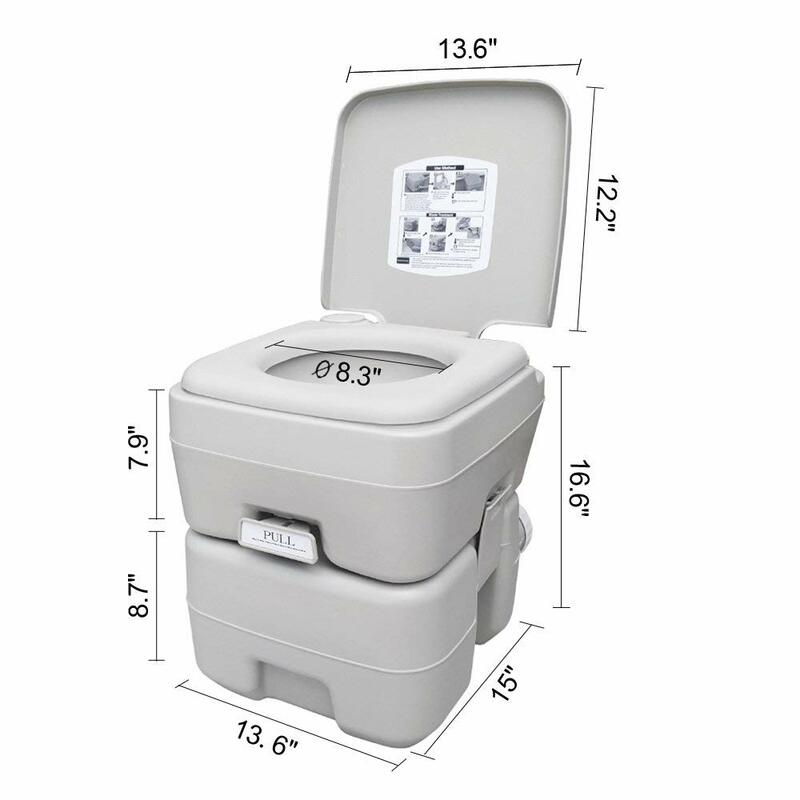 Enters Cleanwaste, the brief-case style portable toilet. It unfolds from a briefcase to the dimensions of a standard toilet. It sets up in seconds to transform into standard toilet dimensions. For starters, the design makes it extremely portable and discrete. Three legs support the seat for stability, even on uneven ground. A removable cover provides support on soft surfaces. With Cleanwaste toilet, there’s no need of flushing. All the waste collects in a bag that contains Eco-friendly powder. The powder turns liquid waste into odorless solid for easy disposal. A mesh holder supports the waste bag to keep it from slipping. There’s a drip edge system under the seat, so no contact with the waste. Cleanwaste toilet has a weight capacity of 500 pounds, which makes it extremely strong. It accommodates users of all sizes without sacrificing comfort. This portable toilet is well designed, sturdy and comfortable to sit on. It’s a handy and viable option to consider. Stansport doesn’t look like much, considering it lacks a flush system. But you need to take a hard look at its construction. 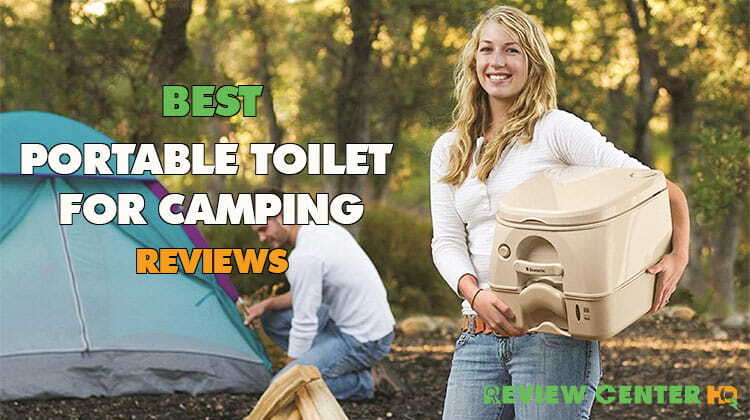 For a sturdy portable toilet, it’s one of the best out there. A sturdy, thick wall provides maximum support. In fact, it can support up to 350 pounds, which makes it the right size for most people. It lacks a flushing unit but works just fine. A disposable sanitary bag installs under the seat to collect waste. You can use with poop powder to eliminate odor and turn the waste into solid stuff. A lockable lid offers a mess-free experience. You get a full-size seat that stands 14 inches high. That’s a pretty good size to save you from squatting all the way down. Carry handles make transportation a breeze. Stansport has heavy-duty plastic construction for long-term durability. 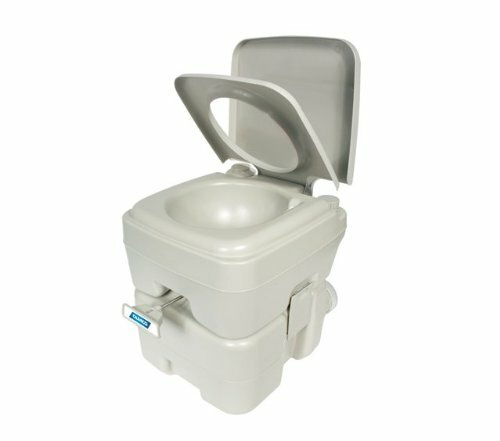 With a price tag that compares to those of other flushing units, the quality of this portable toilet becomes all too clear. It’s as tough as they come and provides home-like comfort for all. Are you the type that values privacy? Or maybe you want to take crap away from harsh weather elements? If yes, then this package is for you. 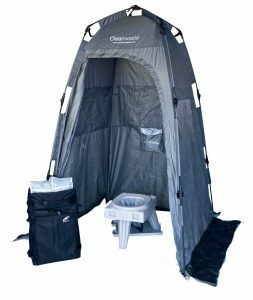 Here, we look at the Cleanwaste toilet, which includes a tent. Together, you get a complete portable toilet system. We have all the particulars of the toilet, so let’s take a look at the shelter. It’s a roomy, one-size tent with 16 square feet of floor area. It fits a Cleanwaste toilet with enough room to spare. The tent stands 6 feet 6 inches tall, which is just the right size for most users. A floor-less base makes for easy sanitation. There’s a zipper door for easy access and privacy. Besides being a toilet shelter, it can double as a shower or changing room. The tent folds into a compact size for easy transportation. A storage bag keeps everything neatly tucked inside. Cleanwaste one-piece system takes your bathroom experience to the next level. The design is top notch, and so is the privacy. It’s a suitable option, especially when you’re hesitant to use a pit toilet. When it comes to flawless construction, you have to give it to Dometic. It’s compact, durable and with innovative technology. A polyethylene construction makes it as durable as they come. There are optional stainless-steel brackets for extra durability and corrosion resistance. The tank holds 2.6 gallons but compensates the small capacity with an innovative flushing system. Fewer pump actions use less water to flush down the waste. In fact, the system uses less than 1 pint per flush. A push button flushes down the waste in an instant. No batteries are needed, the pressurized flush takes care of it all. It completely breaks down solid waste, which allows it to hold more. It’s a bit noisy, but that’s what you should expect from a pressurized system. A spout makes dumping effortless. There’s an air valve that prevents leaks and locks in odors. A level indicator tells you when to refill or empty the tank. The toilet has a full-size 12.5-inch high seat for comfort. Dometic ticks all the boxes when it comes to efficient water use and innovative technology. It’s stylish so it can blend anywhere. Last but not least, is the tough SereneLifetoilet. Sit on it, stand on it – the high-strength ABS construction can take it all. But there’s more to expect besides the robust construction. For starters, this is a flushable portable toilet. It has a 3-way nozzle for full bowl coverage and complete rinse. The freshwater reserve holds 3.2 gallons, which is enough to last over 50 flushes. Below is a 5.3-gallon waste tank that can be accessed easily for waste disposal. A double-seal drain valve protects against leaks and odors. The seat has a cover that locks in the contents after use to prevent leaks. The toilet seat is 16.9 inches tall for comfort. At 13 pounds, this toilet is a bit heavy. But on the bright side, it makes it sturdier. SereneLife is a durable option, and the design is well thought out. It’s a versatile toilet that fits into any outdoor activity you plan. Never bought a portable toilet before? If yes, then how do you choose a unit that’s ideal for your situation and avoid the hefty price tag? There are factors to consider, which will significantly help you make the right choice. I’ll outline and elaborate each one of them. There are two aspects to take into consideration. First, it should be compact to fit in a car or RV. Second, it should be big enough to provide sitting comfort depending on your size. Besides the two aspects, you need to consider the weight capacity. After all, you don’t want a toilet that gives way under your weight. The height of the seat depends on how tall you are. Short users and kids will do just fine with a seat height of around 14 inches. For adults, look for a seat that’s at least 16 inches tall. The old and physically disabled are better off with a higher seat. After all, you don’t want to squat too low. A leak-proof construction is a good measure if the toilet tips over by accident. Look for a tight-fitting lid. Ensure the drain valve provides a good seal. A leak-proof toilet does more than lock in the contents. It offers an airtight seal to eliminate odors. Tank capacity depends on the number of times you frequent the toilet. Also, it will be determined by the number of users. 2 gallons is enough for one person. But for a group of people, say four to five, a 5-gallon waste tank will do. Consider a toilet with a separate waste tank. A disposal chute or spout will be a great plus. For a non-flush unit, settle for one that converts liquids waste into solids. A biodegradable bag is another convenient option. I hope this article helps you pick the best portable toilets for your needs. Remember, a portable toilet is only as good when used the right way. Plus, be sure to buy from the official or authorized stores. Have anything to add or personal experiences to share? Well, there’s a comments section waiting for you.